Within easy reach of Calais, La Bien Assise is a campsite that is attractively located within the grounds of a traditional French chateau. Boasting a wide range of amenities, it is the perfect choice for those seeking a relaxing break in this beautiful region of France. Book online today with LUX-camp to visit this popular site. For those looking for a taste of France without a long journey to get there, La Bien Assise represents an excellent option. Located just 14km from the ferry port at Calais, the ease of reaching the campsite is valued by many guests. Most of the mobile homes on the site feature decking, enabling you to make the most of outdoor dining opportunities, with a charcoal BBQ being provided free of charge. 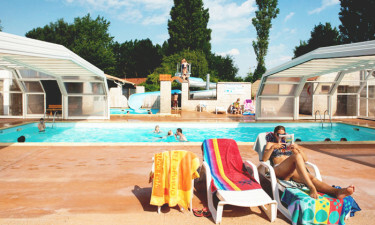 The luxury camping facilities at La Bien Assise include mobile homes that are capable of sleeping a maximum of 8 people. 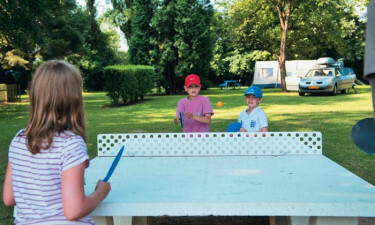 As well as boasting a tennis court, volleyball court and 2 playgrounds, the holiday camping site hosts an extensive games room. With a pinball machine, pool table, table football and a selection of video games, the indoor games room is always a popular location for children and adults alike. Once at the site, you'll discover a wealth of opportunities for enjoyment and relaxation. Sports enthusiasts will be pleased to find that there are numerous activities available, while the indoor swimming pool ensures that the weather needn't ever have a negative impact upon your entertainment options. This luxury camping site is designed to meet the needs of those looking for a camping holiday to remember. There are warm showers provided on the site, together with toilets, washing machines, dryers, ironing facilities and a selection of sinks for washing and dish washing. For those travelling with younger children, there are also baby changing facilities and baby baths. 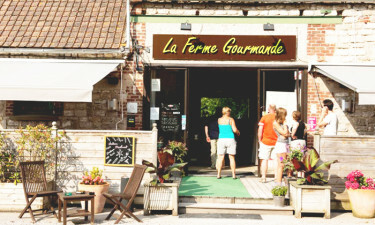 The restaurant at La Bien Assise is known as <i>La Ferme Gourmande</i> and offers a wonderful selection of local delicacies. The menu is packed with dishes that combine fresh, local ingredients and the restaurant caters for all members of the family. It also boasts an outdoor terrace, providing a perfect space in which to relax and enjoy a long lunch. There is also an associated bar and a takeaway that is open during peak season. The on-site shop provides all of the grocery basics that you are likely to require on your camping holiday. You're able to stock up on food, drinks, toiletries and other items that you might require during the course of your stay.